Inspiration by Location, the 2010 Fayetteville Art Show. 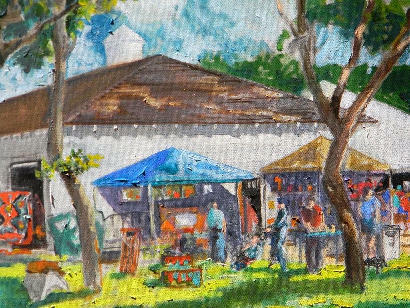 Artist Cindy Fanning painted three versions of the courthouse – rearranging a few of the buildings and including “secret” folkloric details known only to a few. April was very good to Fayetteville with a short article in Texas Highways magazine at the beginning of the month, the art show at the end of the month (actually May 1st and 2nd) and a lot of wildflowers and bicycles in-between. Texas Highways photographer J. Griffis Smith submitted the article’s centerpiece shot – a nocturnal view of the Fayette County Precinct Courthouse – the last original precinct courthouses of three that once stood in in Fayette County. 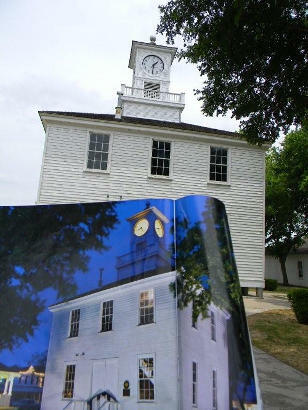 Precinct courthouses (not required by law) saved residents a trek to the county seat at La Grange. 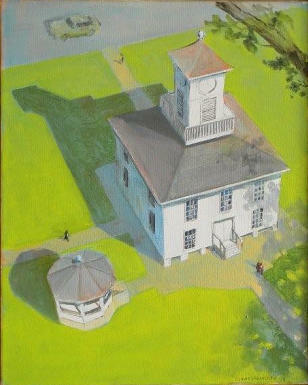 Therefore, it should come as no surprise to find that Fayetteville’s courthouse was a subject of several of the artist’s artists exhibiting at the show. 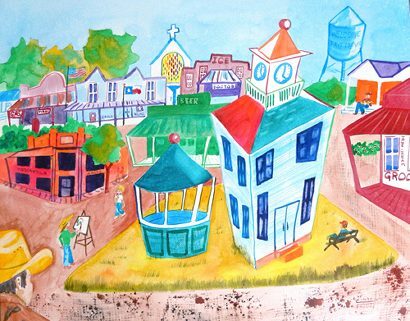 Clovis Hiemsath, an architect long before he started painting, has been intimate with Fayetteville for decades. He owns the town’s only hotel – on the square in the restored Zapp Building (c. 1909). Once only open for special events, the Country Place Hotel is now open 365 days a year. Clovis shares a studio with artist Michael K. Clann, and the two were in adjoining tents at the show. 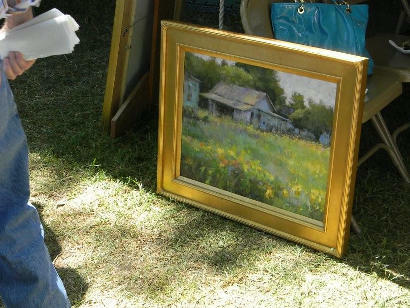 Clann didn’t have a courthouse painting but he did have several local houses – as well as a beautiful subdued painting of Zedler’s Mill in Luling, Texas. 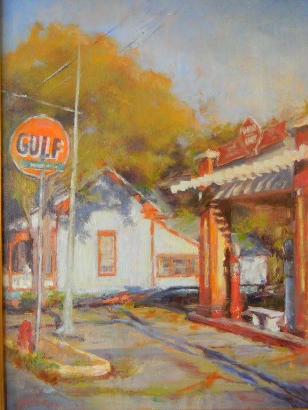 Opposite the Heimsath / Clann spaces was the temporary gallery for Houston artist and designer Janice Mc Cubbin who painted Fayetteville’s restored 1929 Gulf filling station on the square – only 100 feet away from where the photo was taken. While the event had about 50 booths, there was only a single artist seen working (and not one starving, we’re happy to report). 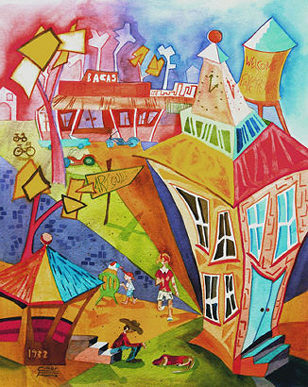 Mr. Heimsath, despite his architectural background, really loosens up with his portraits – many of them local citizens. 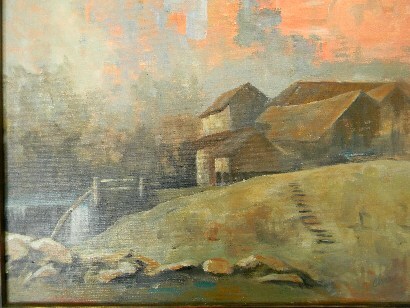 One such painting hangs in Jerry’s general store on the NE corner of the square. 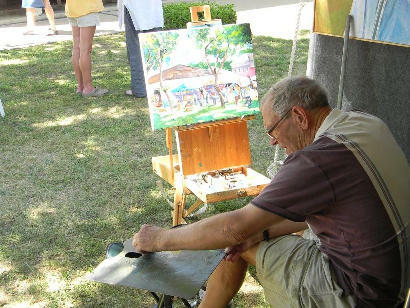 While many two-day events start to wind down on Sunday afternoon, the Fayetteville Art Fair was still going strong at 4:00 with not a single exhibitor packing up to leave. Later that evening, the square once again resembled the Texas Highway's photograph. 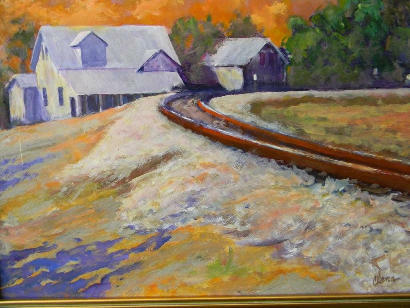 A sold painting by Janice McCubbin awaits transport. Mark your calendar for next year’s event.